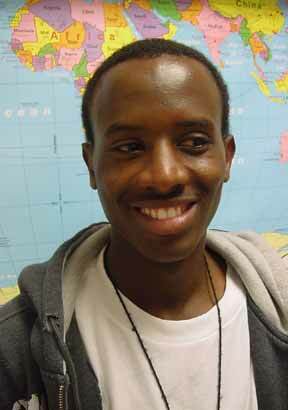 Hello my name is Abdulkdir Muktar I am from Somalia. I lived and grew up in Somalia for 13 years. But now I am in the United States. I want you to know about my experience in Somalia and now in the United States. First we were a family of seven raised by one parent, my mother. My father died when I was 3 years old. At that time when my father was alive we used to live in the countryside. After my father died, a civil war broke out throughout the whole country. My mother couldn’t take care of us in the countryside, so we moved to the city of Mogadishu, the capitol city of Somalia. The worst thing that happened to me in Somalia was not having an education. Because of wars and living in the countryside there were no schools. When we moved to the city there was war but not as heavy. In the city I attended Madras for three years, a school where I learned the Quran. The Quran is the holy book of Muslims, like the Bible is for Christians. After I completed learning the Quran I was planning to go to a different school to study English, but instead we moved to another country Kenya, and lived in Nairobi. We moved to Kenya because my older sister who had lived in the United States for 12 years became our sponsor and we had to go to Kenya so that she could help us come to the U.S.
We lived in Kenya for two years. In Kenya I had some difficult experiences because the people in Kenya were very different from my country’s people. First all the ladies in my country have to cover their whole bodies, but when I went to Kenya I saw a lot of ladies who just looked like men. I was confused because I didn’t know that outside of my country, people dress differently. I thought that everywhere I went women would dress the some as in my country. Then after two months in Kenya I attended a little private school for six months. I was just learning how to write and read in my own language, Somali. I also started to learn a little English, but I didn’t understand a bit of it. Then I stopped going to school because I didn’t have money to pay for the school. After two years of no education in Kenya we moved to the United States. I came to the U.S.A. on July 3, 2001. I enrolled in Blair High School right away. I started in the ESOL program without any English skills. I studied a lot and my teachers helped me to study English. I went from ESOL one through five quickly and now I am a senior in regular English class. What made me successful in school was my hard work – a lot of studying and my memory. I am lucky because I can memorize something pretty fast by only reading it. When I was in the Muslim school, I had to memorize the whole Quran. I was able to do it in just three years. Sometimes it takes people almost seven to ten years to memorize it. I thank Allah who gave me this gift. I can’t believe that I did all this and I am a senior who will be leaving this year 2005. If I compare my life from leaving my country and coming to the United States, I feel like I was in a dark room and someone came and turned on the lights for me. Education has opened my eyes and opened doors for me and for everybody. I thank all my teachers who taught me, especially Ms. Shilling and Ms. Winter.